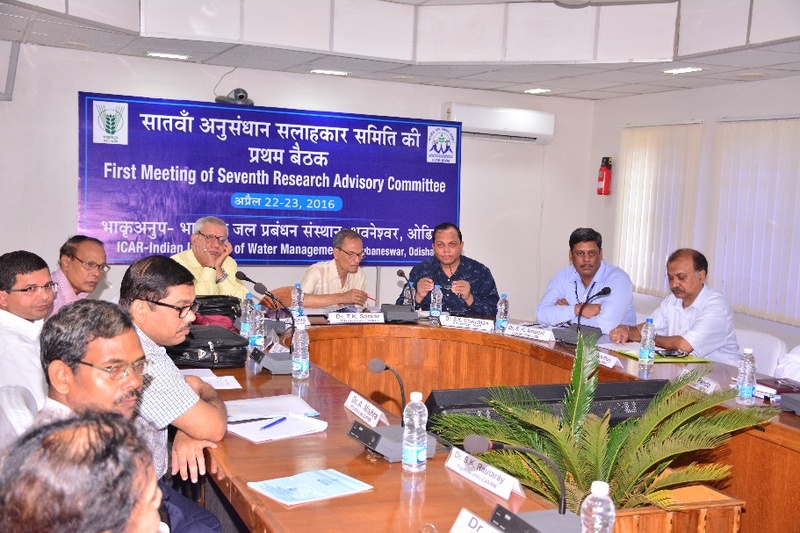 The first meeting of 7th Research Advisory Committee (RAC) of ICAR-Indian Institute of Water Management (ICAR-IIWM), Bhubaneswar was held on 22nd and 23rd April 2016 under the chairmanship of Dr. T.K. Sarkar, former Project Director, Water Technology Centre, ICAR-IARI, New Delhi in the Committee Room of ICAR-IIWM, Bhubaneswar. The other eminent members of the RAC present were, Dr. A.K. Misra, Former Head, ICAR-Indian Institute of Soil Science, Bhopal,Dr. P.K. Mahapatra, Former Dean, OUAT, Bhubaneswar, Dr. M.K. Jha, Professor, IIT Kharagpur, Dr. S.K. Chaudhari, Asst. Director General, S&WM, ICAR,New Delhi and Dr. S.K. Ambast, Director, ICAR-IIWM, Bhubaneswar. Dr. S.K. Ambast, Director, ICAR-IIWM, after welcome address presented the research accomplishments of the Institute. Dr. S.K. 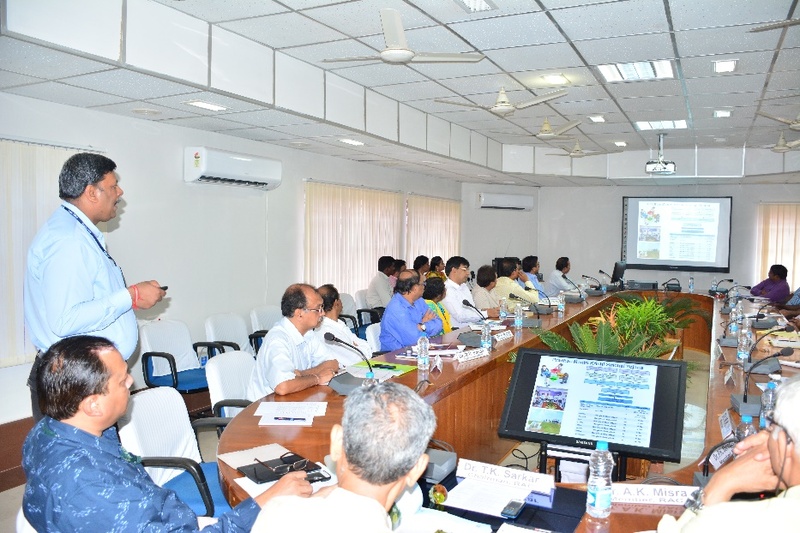 Chaudhari, ADG (S&WM) suggested linking Agricultural Water Management Portal (AWMP) with Krishi website and appraising training details under PMKSY to Council for record. 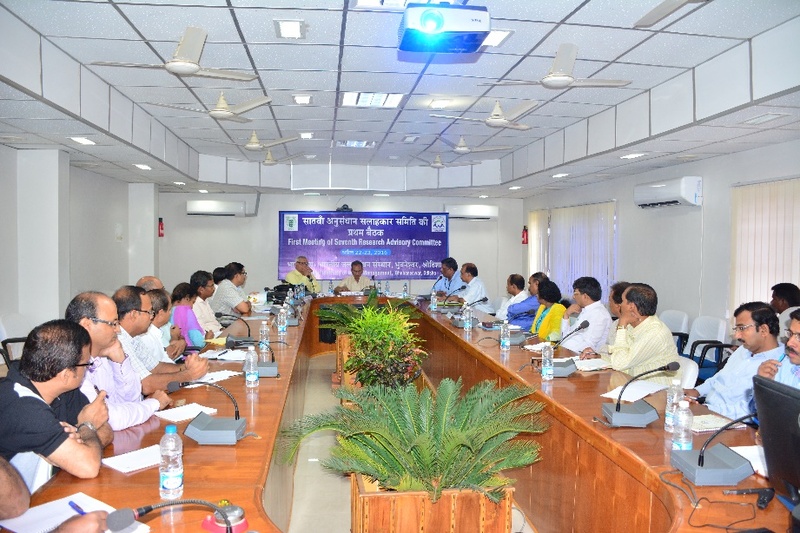 He also urged to link Institute's activities with the work plan of AICRP on Irrigation Water Management. Action Taken Report was presented by Dr. S. Roy Chowdhury, Principal Scientist and Member Secretary, RAC. The members suggested inclusion of high-value vegetables and diversified farming system for enhancing their water productivity. Dr. M.K. Jha advised that a group of interdisciplinary scientists should be involved in the development of an open-ended surface and groundwater conjunctive use model. Theme wise presentation was also made by theme leaders of different programmes. ADG desired to discuss wastewater studies separately though limited to non-food crops, in another meeting bringing all related projects in one common theme. Chairman suggested to make Agricultural Water Management Portal more informative and interactive. It was also suggested to clearly carve out different programmes and scientists involved for focused research.